QMS founder Dr. med. Erich Schulte tells us why exercise is not only great for the body but also for your skin. 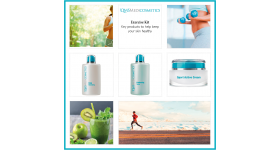 'Regular exercise is key to having healthy skin; even a small amount can have a positive effect (even if slight) on the skin as exercise increases the blood flow and blood carries oxygen and nutrients to working cells in the skin. This enhances the nutrition and metabolism as well as causes a better discharge of metabolites, including free radicals.